Geraldlynn is a lively, astute 14-year-old. Her family, displaced by Hurricane Katrina, returns home to find a radically altered public education system. Geraldlynn's parents hope their daughter's new school will prepare her for college--but the teenager has ideals and ambitions of her own. Aidan is a fresh-faced Harvard grad drawn to New Orleans by the possibility of bringing change to a flood-ravaged city. He teaches at an ambitious charter school with a group of newcomers determined to show the world they can use science, data, and hard work to build a model school. Mary Laurie is a veteran educator who becomes principal of one of the first public high schools to reopen after Katrina. Laurie and her staff find they must fight each day not only to educate the city's teenagers, but to keep the Walker community safe and whole. In this powerful narrative non-fiction debut, the lives of these three characters provide readers with a vivid and sobering portrait of education in twenty-first-century America. Hope Against Hope works in the same tradition as Random Family and There Are No Children Here to capture the challenges of growing up and learning in a troubled world. 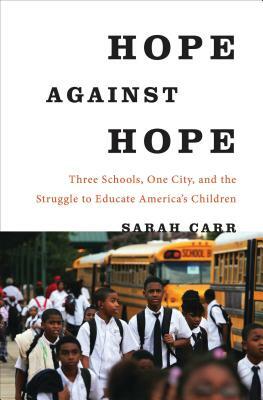 Sarah Carr has written about education for the last twelve years, reporting on the growth in online learning in higher education, the battle over vouchers and charter schools in urban districts, and the struggle to educate China's massive population of migrant children. Her work has been honored with numerous national awards and fellowships, most recently a Spencer Education Journalism Fellowship at Columbia University. She lives in New Orleans.